When I'm in the mood to travel to Medieval Scotland through the pages of a book, Julie Johnstone is one of the first authors to whom I turn. Time and again, she creates intriguing, complex characters who capture my interest and my heart then skillfully guides them along a tumultuous, frequently dangerous, always emotional journey to the love and happiness they so richly deserve. Her ability to bring the Medieval era, Scottish countryside, and people of that time to life through her words never fails to immerse this reader deeply into the lives of her characters as they battle the forces standing in the way of their HEA. I adored Broch. My heart ached for the boy inside the man who had always stood just outside the circle of his chosen clan and rejoiced when he finally found his rightful place. I admired his tenacity, his loyalty, his sense of honor, and his patience. And I fell hard for his tender heart. He needed a strong woman to challenge him and, boy howdy, did Katreine fit that bill! She's more than earned her "hellion" status but the reasons for her fierceness are those to which anyone who has lost a loved one to tragedy can relate. And it's that very quality that draws Broch to her. The banter between these two is all that is wonderful but the tenderness, respect, and trust that slowly develops and gradually opens their hearts to the possibilities of love is all that and more. There's much more to this story involving clan feuds, deception and betrayal, mysterious murders, and sibling rivalry but going into detail would reveal spoilers that are better discovered within the pages of the book. I will just say that there are multiple secondary characters who I sincerely hope we'll be seeing more of in future stories. When a Highlander Weds a Hellion is the eighth book in Johnstone's Highlander Vows: Entangled Hearts series. While readers of the series will recognize Broch from appearances in previous books, this book stands completely on its own. 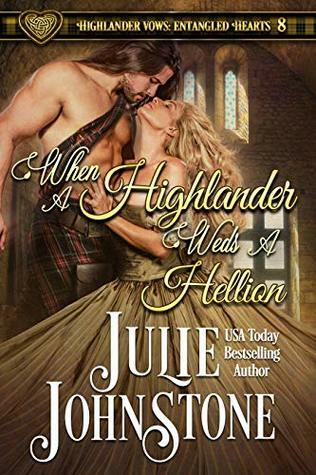 However, if you're in the mood for a fast-paced, adventurous, and deeply emotionally Medieval romance, you can't go wrong with Julie Johnstone. I highly recommend all eight books in the series. Do you enjoy Medieval romance? Who are some of your go-to Medieval romance authors? There are only a few Medieval authors that I like and Julie is definitely a favorite. Others include Amy Jarecki and Emma Prince. I haven't read Emma Prince. Thanks for the rec! While I do read more Regency romance than Medieval, I do think Julie Johnston does Medieval the best. Can't wait to read it! It is all new to me. I have read mostly Regency Historicals. You have made this book sound like a terrific story. You generally do. Which is one reason I get in trouble reading your reviews....but that Is my own fault for being a book addict. I will say that because I am a fan of character driven stories, this does sound like a book I would enjoy. I have a book by Ms Johnstone on my Kindle. Thanks, P J for another terrific review. I'v only read one of Julie's books, which I enjoyed. I love Jennifer Ashley, Suzanne Enoch, Amanda Scott, Amy Jarecki, Paula Quinn plus many more. I've read one or two other books by Julie, but not this one. Thanks for the review. I like Ceci Giltenan and Glynnis Campbell.